Tuesday Two Minute Tutorial: Make your own Wine Vinegar! For this week’s Tuesday Two Minute Tutorial, Dave shares how to make your own custom wine vinegar. You can use this for any recipe which requires a fancy vinegar for much less money! Try making your own wine vinegar and using it to make last week’s tutorial- vinaigrette! Tuesday Two Minute Tutorial: Balsamic Vinaigrette! We stopped buying dressing years ago, and you can too! Check out this week’s Tuesday Two Minute Tutorial to learn how to make Harris’ Signature Dressing- Balsamic Dressing. This dressing requires only 3 ingredients! Seriously! Harris uses just a plain Balsamic, but any quality vinegar will do! Never buy store bought again! 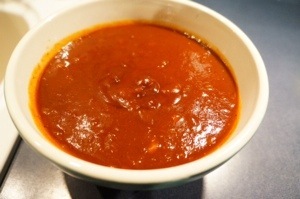 Friday Grilling: Dave’s BBQ Sauce! It’s Friday and we’re so excited for this weekend! We are busy working on our deck and can’t wait to start some outdoor cooking. So in the spirit of our excitement, we’re making barbecue! Try Dave’s special sauce! In Leah’s opinion, it is smack-your-mama good! Sauté the chopped onion in the butter. Once translucent, add the tomato paste. Once the onions are browned, add the ketchup. Brown the onions and ketchup. Then, add the remaining ingredients. Cook until the sugar is dissolved. Once cooked through, process in a blender. You can skip this step if you don’t mind chunky BBQ sauce.